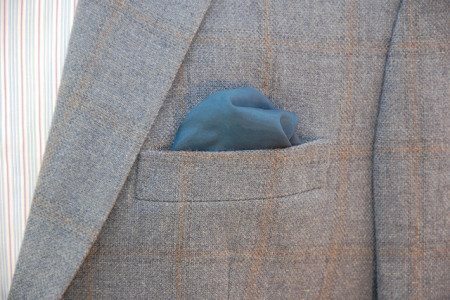 Of all the various accessories available to the gentleman, the handkerchief in the jacket’s breast pocket is quite likely the least understood. What color to choose, which fabric is right, and how to fold it properly are just some of the questions that add to the apprehension. The dress handkerchief doesn’t have to be a mysterious and frightening item; with a little know-how and a few simple rules, it can become a standard – and debonair – part of any gentleman’s wardrobe. The cardinal rule of dress handkerchiefs – or pocket squares, as they’re often called – is that the handkerchief is never identical to the tie. The patterned, silky squares that come attached to ties should be ignored outright – they’re there for convenience, not style. 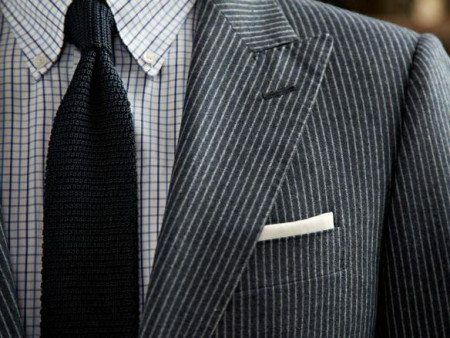 A dress handkerchief is intended as an accessory that brings a bit of contrast and attention to a suit, and that can’t happen when it is perfectly-matched. Even worse, it tends to make the ensemble look like a package special, which is never what the well-dressed man is looking for. 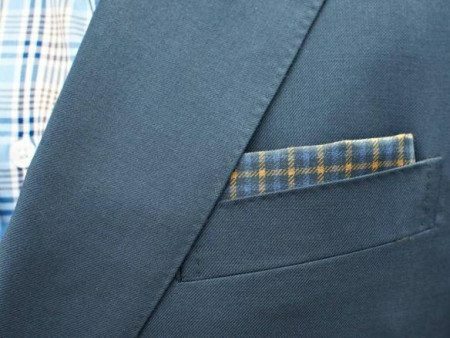 What you should strive for is a pocket handkerchief that perfectly compliments your outfit; like a well placed garnish, it should only add to the presentation and never overpower or take away. One never uses a dress handkerchief for anything but show. Instead, carry a plain white cotton handkerchief in your trouser back pocket for general use. Just as a gentleman wouldn’t think of using his tie to cover his nose, or using his jacket to mop up a spill, so likewise he does not use his dress handkerchief for such tasks. A secondary benefit of having a handkerchief for regular use is the aristocratic impression it tends to convey. It is a lost art to see a man provide a clean white handkerchief to a lady who is suddenly overcome with emotion or other distress. One quick note: insist that the lady retain the handkerchief after she has recovered. 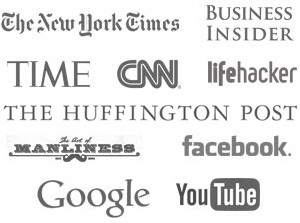 A warning: many retailers offer small squares of cardboard with fabric attached, intended to imitate the look of a square without actually learning to fold it. 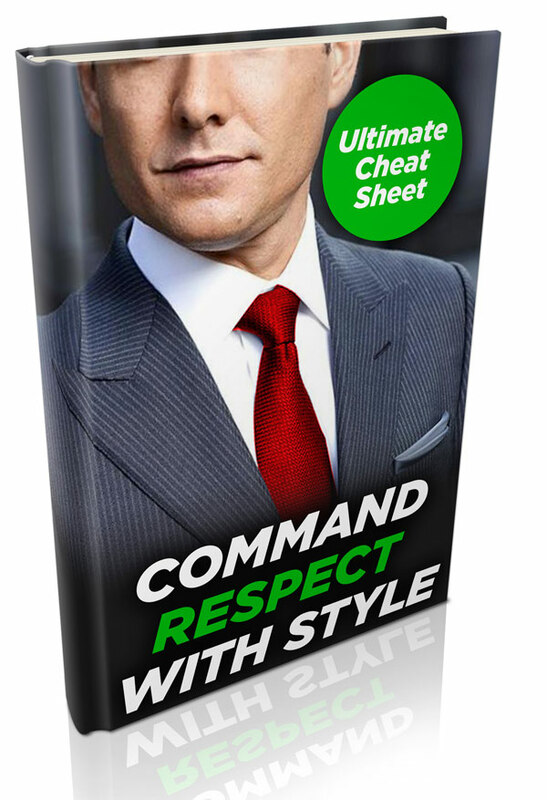 These are like pre-tied bow-ties and clip-on neckties: shortcuts that any stylish gentleman should avoid. One of the greatest benefits of learning to dress elegantly is the control it affords over one’s attire, control that clip-on ties and cardboard squares can never provide. The options for dress handkerchiefs are endless: a wide number of fabrics from which to choose, an infinite array of colors and patterns, and a world of origami-like folds await the gentleman who decides to adopt it. The dress handkerchief is an elegant touch brought to a well-crafted ensemble, and a symbol of the confidence in ones own style, displayed for the world to see.